Yesterday was my second visit of the season to the farmer’s market. 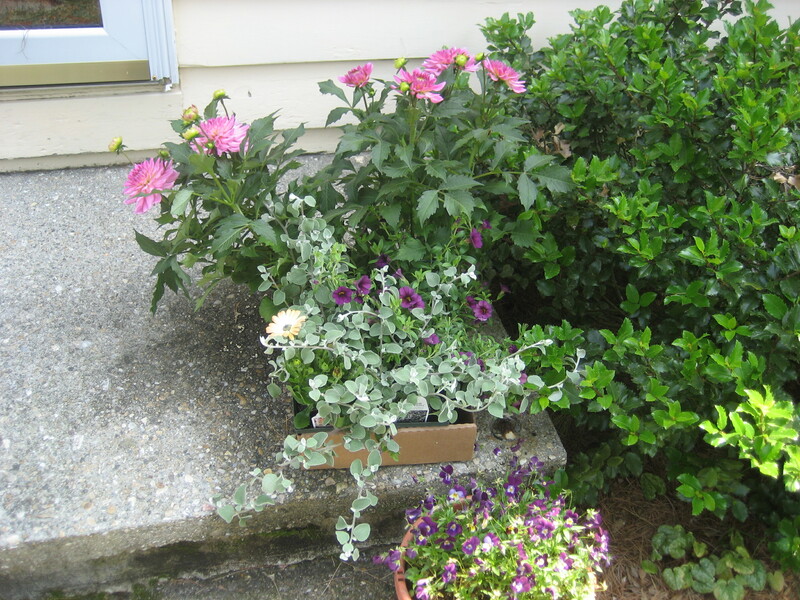 Early on in New England, there is little local food to be had, so the farmer’s market is generally just a rainbow of annuals filling the parking lot that they occupy. It’s very pretty but a dangerous place to be for a person who loves plants. I figured that a few more vendors might be out by now and I’d give it a try. During the peak of the season my favorite artisan bread baker has a booth, there’s a spice man, a mushroom man, a cookie guy and even an organic grass fed free range meat person. This time of the year however, there were just the handful of hardened regulars who are there in the rain, at the very beginning of spring, and late into fall. Eggs were on sale at the local supermarket for $0.99/dozen. Babci wanted some eggs, but I convinced her to try some local eggs I heard are much tastier. She agreed and off we went. When we got there, we went our separate ways and I gravitated towards the perennial guy. I can’t tell you how much money I’ve spent with him over the years. I was chatting with him about what the heck I could do to get rid of an invasive ground cover he sold me a few years back, when Babci comes over. She whispers to me, “I found the eggs..they want $4/dozen.” She said it as if she was trying to cover for a crime the vendor was trying to commit. “Nobody’s buying them.” “What kind of chickens produces $4 eggs? They must be living in solid gold coops.” Needless to say, even if I was bent on getting some local eggs that day, Babci was ready to fight me right then and there if I tried buying them. She didn’t raise a daughter that paid a 400% mark up on anything. She declared everything was too expensive and off she went to sit in the car while I finished my shopping. Babci loves the farmer’s market but not this time of the year. 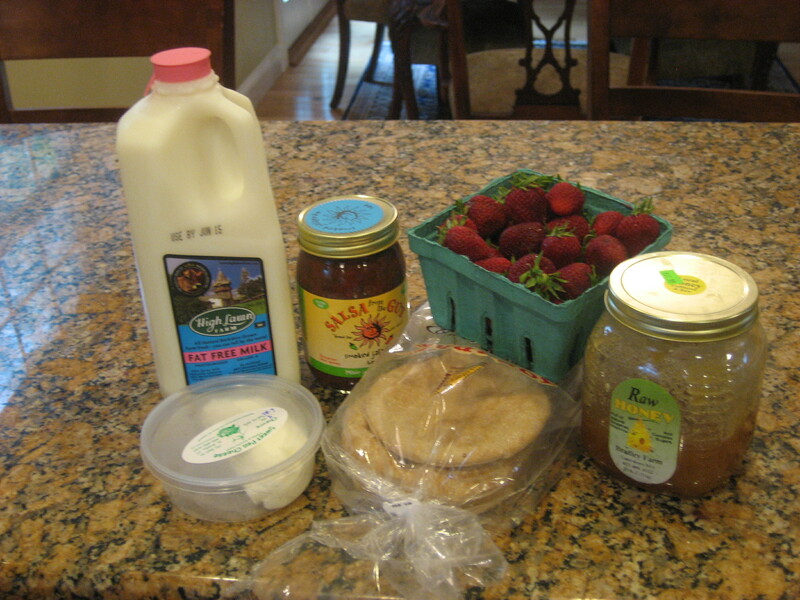 I bought local strawberries ($4.50), pepperoni bread ($6), radishes ($4), goat cheese (? don’t remember) and a bunch of annuals to fill my porch planters. In total, I probably walked out of there spending $70 and I only had a handful of things that were eatable. I’ll admit that my farmer’s market is on the expensive side and I have a weakness for flowers. It’s almost always more expensive than the grocery store except late in the season when they’re trying to get rid of excess produce. I felt like I did my good deed of the day but I also felt like this type of spending was not sustainable for our family either. Realistically, if I paid a 400% mark up on everything I bought so that I could support local farmers, then my grocery budget would balloon to over $2000/month. Who can do that, even with 2 incomes? I’ll admit, the egg thing bothered me. Was it really that expensive to buy free range eggs? I was prepared to pay a little more, but not that much more. I swear I have driven by little signs in the road advertising eggs for $2-$2.50/dozen. I tried my closest farms and checked craig’s list. It seemed like $3.75-$4.50 was the going rate in most places. There were a few $2 places, but they were an hour drive from me, so the gas would offset the savings. Then I found it, Star’s Hollow Farm. The eggs were $2 a dozen and in the farmer’s ad on Craig’s list, she even said that we were welcome to meet her chickens. The farm is about 20 minutes from my house and on the same road as berkshire mountain bakery my favorite bread store. They were recently voted one of the top 10 bakers in America. I really do live in a foodie’s paradise. Score. I think the lesson here is that buying locally is no different from regular grocery shopping. You can’t just go to one place all the time and expect to get the best prices. You have to shop around and know who has the best deals on certain products. Unfortunately, it’s not as convenient as the grocery stores where the sale circulars come to your door every week, but it is possible. With what you just read about Babci, you’d think she wasn’t picky about her food, but she really is. This same vendor that sells the $4 eggs, has the most delicious raw honey we have ever tasted. It has a gorgeous floral finish that is just divine. We don’t have any problems paying double for this honey vs the cheap clover stuff in the teddy bear bottle. The difference? Well, it takes me at least 6 months to go through a jar of it, so paying double really doesn’t put a big dent in the food budget. Same thing with vanilla. We have a local vanilla shop here and a big bottle is about $26. We like supporting that particular business and are okay that it cost 2x the normal price and 10x what the imitation generic stuff costs. Why? Because it makes a big difference in the final flavor of our cookies and a bottle of vanilla lasts us about 4 years. Maple syrup on the other hand, we have to shop around. My kids eat waffles several times a week, so we go through gallons of it every year. At a couple of the farm stores, it’s been running about $10 more a quart to buy from the guy down the street vs Vermont brand from the grocery store, so I get the Vermont stuff. Sorry Canadians, you’re too far but Vermont is a 20 minute drive from me, so they’re fair game. Next on the list is beef and chicken which will definitely require some shopping around. Again, we only eat those 1/week, so I think we can do it without killing the food budget. There’s a great listing of regional grass fed farms by state on Eat Wild. Rikki Carroll, the Cheese Queen also has a great list of “Good Milk” Sources on her Cheesemaking.com website. For Farmer’s Markets and local farms, there is a pretty good search tool on the USDA Site that had 2 out of the 3 farmer’s markets listed in our area. Local Harvest also has a great search by zip feature, that pulls local farms, csa’s etc. Farm Fresh.org is also a good site and well organized by food category which is convenient. They even have a list of pick your own vendors which is always a fun family activity. I think everybody can do a little something. Not all items will break the bank. You should do a search by your area and see what comes up. I was surprised by a few businesses that popped up on the local harvest site that I didn’t know about. Just to make myself feel better that I am making some progress, here’s what I’ve got checked off the list. Each person’s list will vary depending on the region they”re in, but I’m hopeful that I’m making some progress. Maple Syrup – Digging around for my eggs, I think I found a closer and cheaper source at Holiday Farms. Looks like I can save about 50% if I buy by the case and get it in mason jars. Eggs – soon.. I used to trade eggs for Kraut, Pierogies and Jam with a friend of mine but her chickens keep getting eaten by sneaky foxes, so it’ll be a while before she has excess. I’m hoping Star’s Hollow will be a hit. Bread – 50/50. We do a mix of local artisan bread and sandwich bread. We mainly use nature’s pride and arnold. Interestingly enough, Nature’s pride is a division of Hostess but it took some digging to find that out. It’s no where on their website. Arnold is in PA, so that’s not too far. I also go through bread baking phases, but mostly in the winter. Milk - Crescent Creamery – I can literally walk there from my house and they have the most delicious milk. Even Babci’s hooked. Rikki says that their milk makes the best home made yogurt of any of the local sources she’s tried. Cheese – 50/50. My kids go through a lot of cheese sticks, but there are many great local cheesemakers in my area too. I can even find many local brands at my grocery store. Seltzer (we don’t drink soda) – Polar – They were one exit down from where I grew up. They also own adirondack selzer, nantucket nectars, snapple and a bunch of other brands. Salsa – Dave’s Salsa from the Gut is the best salsa I’ve ever had. He starts by smoking jalapenos on apple wood. I mail order it by the case and he does give a case discount. I found him at a garlic festival a few years back. His personal website is not working, but I usually just call his number 802-747-9017 and he’ll fax or email you an order form. He only makes batches once in a while so don’t expect a speedy turnaround, but it’s well worth the wait. Beer - Berkshire Brewing Company – I’m spoiled to have such a great brewery nearby. I also still buy Sam Adams Boston Lager and buy a lot of different microbrews. I think you can’t go wrong supporting any of the regional breweries in the US. Well, if you’re on a similar journey, I’d love to hear what you’ve been able to source locally and what your challenging foods are. I know for me that will be any kind of citrus but I’m not going to be a purist in my venture. Florida and California farmers need income too. LOL on the $4/dozen eggs. That’s what my sister sells her eggs for – she never has enough for the demand so I was trying to convince her to bump her prices up to $5.00. She won’t because she’s a health nut and hates big agri-business and thinks it’s important to have them available to everyone. Mind you, she also delivers. But Omega 3, organic eggs here in the store are $3+/dozen and my sister’s are 1.5 times the size (don’t even fit in an X-L carton). Her chickens sell for $25-$30/bird, but they’re HUGE. She needs to charge that much to make anything on her costs since the government requires more and more “processing” regulations to be followed every year, thereby squeezing out the little guy and making products more expensive for consumers. Or just not available at all. We have very few locally made food products where I live – except Spitz sunflower seeds. For whatever reason, they cost ~ 1.5 times more here where they are produced than across the border in the US. We do have Taber corn, and the fruit vendors park along the sides of the roads in the summer advertising “BC fruit” for sale. Where I grew up there was a big Ukrainian population and a few successful sausage places. There are just very few hobbyist farmers anymore due to economies of scale, having to be near the city to sell anything yet the land near the city is uber-expensive. Your friend should get a guardian dog. My sister has one (and an electric, portable fence). Jacq – My friend has a pretty fierce goose. Does that count? Her price seems reasonable for home delivery. Just the other day I bought burgers from my “meat man.” He’s kind of like a door to door meat salesperson. He’s really nice and the convenience and vacuum wrapping of his stuff makes me pay a little more. Great post! Our local free-range CSA-add-on eggs are $2.50/doz. Nicole – I remember your radish post and everything I’ve read about your farmer’s market makes me jealous. You’re prices are terrific. We buy free range eggs (or at least I know they’re better somehow than regular eggs) at the grocery store. I think they’re $3.50 a dozen and my wife always lands $1 off coupons so they turn out to be around $2.50. Still more expensive than the $1 per dozen eggs but my wife insists upon them with our little one. I know it’s a small thing but the other day I spent more on potato chips for Little Boy Beagle’s party. We have a local company and theirs were $5/2 versus the Lays national brand which was $4/2. Money Beagle – I know a lot of people who say they are tastier and better for you. $2.50 is reasonable anyway. It’s great that you found a good deal on locally produced eggs. One big difference between the Star Hollow eggs and the ones that you saw at the farmers market: transportation. You pick up the eggs from the farm, whereas at the farmers market they transport the eggs themselves. The farmers market vendor has to pay something to the market, too, so the $2 difference in cost seems to make sense from that perspective. I am all set with honey and maple syrup for a while (maybe years). Some friends that had bees packed up and moved, gifting me with a big bucket — about 60 pounds — full of honey. Honey keeps indefinitely so this stuff will last me a loooonnnggg time. Unless I decide to turn it into mead or something. 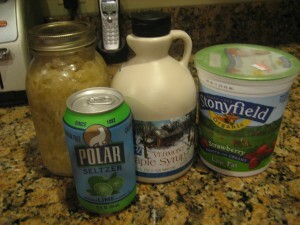 They also gave me a huge jug of maple syrup from a local (to them) farm in Indiana. That’s in the fridge and is slowly being used up, although I don’t use much maple syrup. I used to have my own hens for eggs and I need to get back into that again this year. I miss my ladies! Over the winter I was paying crazy prices for eggs from pastured chickens ($6 dozen), but now that the farmers markets are open I’m sure I can get them for less. I don’t eat a lot of eggs, either. Funny how having my own chickens resulted in me being much more concious of how many eggs I use; I learned to use less eggs when the hens weren’t laying much. I had an interesting conversation with a farmer at a party over Memorial Day weekend. His idea: having people buy a heifer or cow, then charging an annual fee for pasturing and breeding it. The cow could be bred for up to 12 years, each year producing a calf that would be pastured and then slaughtered at the appropriate age/weight. So for the up front cost (roughly $1200) and annual fee (roughly $500), a family or group of people would get a full cow’s worth of pastured beef every year for about a dozen years. Of course, there was the risk of a) the calf dying, b) the cow dying, c) the cow not getting impregnated, any of which would result in no beef, but (except in risk b) still require an annual fee to keep the cow alive until the next breeding season. It would be like a CSA for beef, I guess, where you pay up front and share the “crop” risk with the farmer. Interesting concept, eh? Linda – we actually have a local ice cream store here who was trying to raise startup capital to buy equipment and instead of selling shares of stock, they sold cows. You bought a bit of the company by purchasing a milker. Once they got off the ground, they gave you your share of the profits. One of my friends did it and doubled his money. It is a great idea. PS. The transportation thing is a real added cost and good point. I second all the people on locally produced eggs. We sell ours for $5 / dozen, but we donate all the proceeds to our church, so it’s not really a fair comparison. However, with free range chickens, your corn costs go down (but don’t disappear), but your other costs go up. For instance, the neighbors dog came in and took out 3/4 of our flock one afternoon this spring, which means that we needed to buy all new chickens and had several prime egg-laying months without many egg-layers. This isn’t a problem for those who cage their chickens. In our opinion, the only reason to produce local eggs is to have eggs with high levels of Omega 3 fatty acids, and the only way you get that is by letting them out to eat green things. (Omega 3s are a result of the chlorophyll from grasses and plants eaten by animals.) So we take the hit when something gets our chickens so that we can have the eggs we want. This makes our eggs more costly. I’d probably be willing to give a big discount if people would come and pick up, though. We deliver our eggs at church, and it’s kind of a pain. Farmers’ Markets, would, I think, be even worse, because that would be time out of our productive day that we would spend selling. Goat – Babci grew up on a farm and had pigs, chickens, geese and all that stuff. She knows how hard it is to manage a farm and the heartbreak of losing animals to predators or disease so I feel okay sharing her opinion in this article. We go through many dozens of eggs every month, so it’s definitely an area that would add up quickly if we didn’t have a max price set for them. I think the compromise position is a good one. I’m willing to drive to a farm and pick them up in exchange for lower overhead and hassle for the farmer. They don’t have to take time out of their schedules or spend money on gas to sell them. It’s a win/win. Like you, I think it’s unrealistic to want it all. The rock bottom prices, the convenience and all the health and flavor benefits of free range eggs. In my case I’m willing to sacrifice some of the convenience and some of the price. Thanks for commenting. I expected some comments on how $4 is a fair price for what you’re getting and it is. If we didn’t eat so many of them, I’d be okay with that price but since it’s a high volume item for us, it was worth shopping around. Our farmers market sells eggs at $6 a dozen. *sigh* They’re usually those double-yolk ones so I try and convince myself it’s not TOO bad. But it hurts. I haven’t bought them in months. Mutant – Yikes, well if you get 2 eggs in 1, then maybe it’s not so bad after all. There is actually a big “Kentucky Proud” initiative in the state, and they lable items that are cultivated/made locally in KY. We try to get those items when it makes sense… There is locally made pesto/pasta sauce that we can’t get enough of. Ted A – we just got a local distillery here too but I don’t much like bourbon, so you can keep your Jim Beam. It’s nice that you live in a climate that has a longer growing season. I’m sure you have more options than I do. Local food really does taste better. I admit that I have no idea what I pay for eggs, but I buy them in bulk at CostCo, so it can’t be very much. When I lived in Colorado, where it’s hard to grow much, farmer’s markets were almost universally more expensive than grocery stores. In Atlanta, there’s more nuance … in some cases, stores have cheaper produce, in other cases, the farmer’s market is where it’s at. It’s nice to finally have options. Paula – I have friends in CO, and I remember visiting the farmer’s market and being amazed at how tiny their gooseberries were (I guess because they don’t get much water). Well I know you can get a good deal on peaches down there. Plus you’re close enough to FL that you probably have no problem getting good priced citrus. I finally made it to our (new) local farmers market in Atlanta (we have others, but the one nearest to my house is new this year.) I think a good tip, especially for hot areas, is to go earlier in the day. It’s so hot in Atlanta, and everything just seemed wilted by the time we got there around 1pm. Next weekend I’ll make it a priority to get there earlier, and see how it is then. Kellen – I think going early is a good tip for anybody. Our temps were in the 90’s last week too. My radishes got all limp after a day too. I should have kept them in water. Crystal – Food has always been one of those things that I splurged on my budget. I’d rather spend more on food and less on clothing and toys. No way I’m buying generic tuna that’s a pile of mush water..been there, done that. Plus, my mom was a farmer so I have a soft spot for them. But it’s not for everybody. If you want to support a local business but are okay getting everything from the grocery, you can do it with restaurants, christmas gifts, art, services etc. I’m sure there are some people who’d rather get a massage than eat exotic cheese, and that’s ok.
You are so lucky to have such easy access to such great foods! I am living with a lot of envy right now. I would pay the money for the vanilla too. I bought imitation vanilla and used it once and wanted to throw out the cookies I made. With vanilla, you truly get what you pay for. I have never bought eggs anywhere except the grocery store. I buy ‘egglands best’, which I think are around 2.79 a dozen, but I usually have a coupon which brings them to around 2.00. However, I would love to get fresh eggs locally. I do know we have a farmers market too far from here, but I never heard great things about it. Kris – I am lucky. I have lots of farms everywhere and upstate NY and VT is plastered with them. I remember your vanilla article. Well I know you have cherries up there in the summer. “What kind of chickens produces $4 eggs” LOL! Can’t argue with that! I’ve been reading around your wonderful blog. This one resonated with me because I can’t spend so much on farm eggs either! Just cannot do it. Also, I visit your neck of the woods every summer and I loved reading about the familiar places–and pizza. Frugal Scholar – If you are in the area shoot me an email. I’d love to meet up with you. Baba Louis is the best isn’t it? I can’t imagine paying $4 for a dozen eggs. I do insist on buying eggs from our state, but Costco, Henry’s and other grocery stores carry them. Kay – I just found another place that charges $6. I don’t know how it can be seen as anything but charity paying that much of a markup. It doesn’t take many items with that big a price delta to put a big negative dent in the food budget. I sell my eggs for $3/dozen which is $1 less than the organic ones in the grocery store. It pays for my feed but I don’t make a profit. I sell my whole chickens for $4.50/lb which is almost $1 less than the organic ones in the store or at the farmers market. Again, I don’t make a profit. I break even and get my own poultry free. It’s tough because I want the food I sell to be affordable but unless I increase the size of the operation I can’t pull a profit. I myself hate spending high prices for food and if I can’t afford local and organic I go with local first. Molly – that is exactly what Star’s Hollow Farm is. It’s just a small family who likes fresh eggs and chicken. I’m sure they don’t make a profit but use the egg proceeds to help subsidize the cost of having their own eggs and birds. I am so happy to support someone’s attempt at healthy living and get good eggs in return. Even with local eggs there is usually a middleman or two involved unless you go right to the source. The last $6 batch I saw is being sold by one farm on behalf of another, so there are two profit margins built into that equation. Little House – I think just being in CA means that most of your produce is local, so you get brownie points just because of where you live. I’ve been doing a little research. Our local meet is crazy expensive. Still shopping around. There’s a meat CSA that has some promise but I haven’t called on prices yet. I’d like to eat more local, fresher produce….but being in suburban Chicago we would have to trek to outside this mammoth metro area to outlying farms – or go to some farmers markets. It may take a lot more effort around here, but admittedly I haven’t given it the requisite thought. One thing I can tell you, from my suburbanite experience, is that a 2.5 hour trip to Michigan to a blueberry farm (or is it patch? field?) showed me how good fresh foods can be. After picking the berries and washing them right away, I ate them – literally a few minutes after they were still unpicked. Anyway, they tasted WAY better and more flavorful than store bought “fresh” produce.